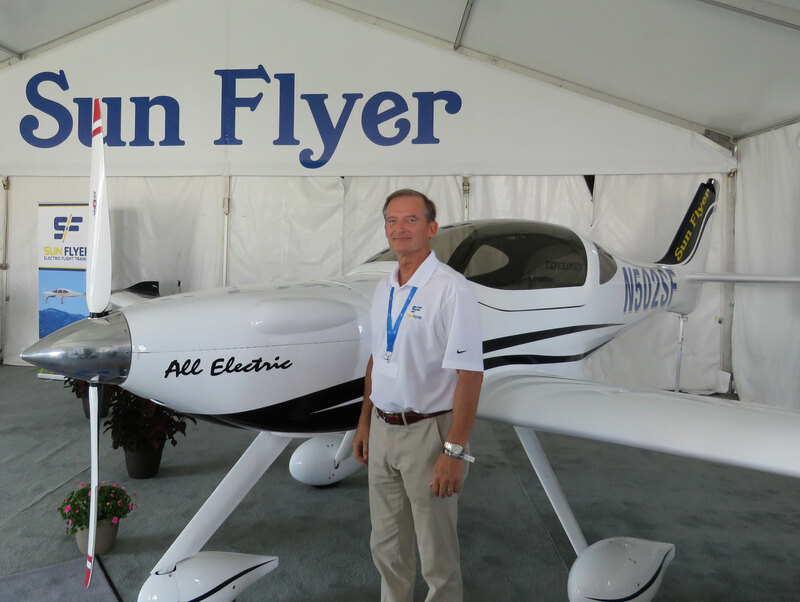 Aviation entrepreneur George Bye brought his Sun Flyer 2 all-electric, proof-of concept trainer to AirVenture this year and announced plans to launch a four-seat model called the Sun Flyer 4. Bye said the Sun Flyer 2 is priced at $249,000 and the 4 has a launch price of $349,000. All ground run testing on the Sun Flyer 2 has been completed, he said, and the company is aiming for a first flight this fall. He estimates a certification program would likely take two to three years and added that his company is attempting to certify the Sun Flyer 4 in parallel, with changes. Spartan College of Aeronautics and Technology is the lead deposit holder for both models. The Sun Flyer 2 is a day/night VFR aircraft with a maximum 440-pound payload (same as useful load, since there is no fuel weight), 120-knot maximum cruise speed, three-hour endurance, and $16 per hour direct operating costs. Bye said battery charging time between flights is 20 to 30 minutes. The Sun Flyer 4 is a day/night IFR aircraft with an 800-pound payload capable of 120-knot max cruise speed, a four-hour endurance, and $18 per hour direct operating costs.